DeTOS is a Linux based operating system that provides an intuitive user interface to make creating and maintaining remote desktop connections and terminal settings simple. It is a robust operating system that offers a wide array of virtual desktop solutions that can meet the demands of any IT environment. 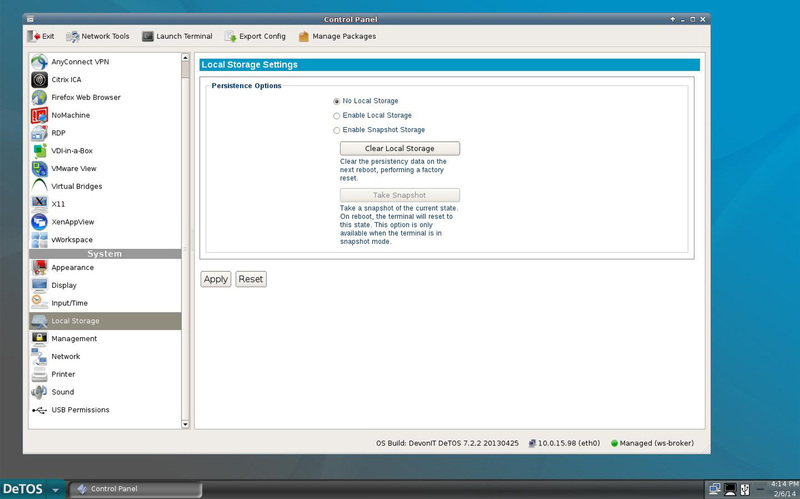 Configuring a session out of the box is quick and painless using DeTOS’ first boot wizard. The wizard guides first time users through setting up their initial terminal configuration. Thin clients running DeTOS can detect and connect to the available wireless networks. VPN allows users to work remotely while retaining access to the devices and networks normally accessible from their workspace. DeTOS also includes a built-in Firefox 5.0 browser that allows accessing web based applications. The DeTOS Operating System is compatible with Echo management software. 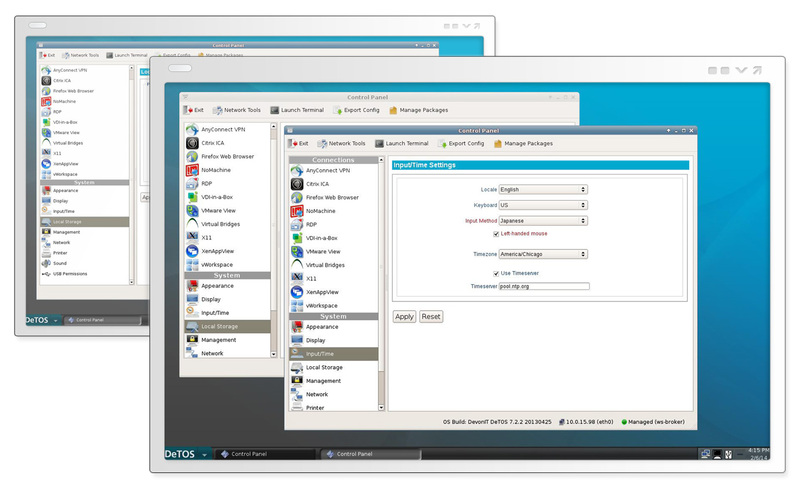 DeTOS provides an intuitive web based control panel which can be used either locally from the thin client or remotely from the Echo thin client management software. Connects to hosted desktops using the industry’s best protocols: PCoIP, Citrix Receiver 12, RDP, and VMware Horizon View. DeTOS providing intuitive user interface to make creating and maintaining remote desktop connections and terminal settings simple, receives the 2013 Reader’s Choice ‘Preferred Product Award’ for Thin-Client and Zero-Client Computing in the Virtualization Review. 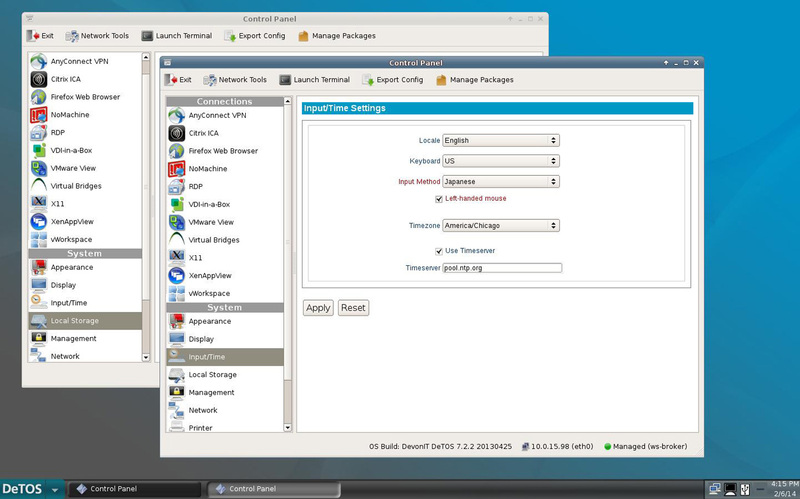 DeTOS includes a software feature that allows a thin client terminal to run in a zero client configuration mode. While in this zero client configuration, terminals can access the virtual desktop through a passive DNS environment.